A drawing of the #18 and the special train that the railroad sent to the Panama-Pacific Exposition in San Francisco, CA, in 1915. 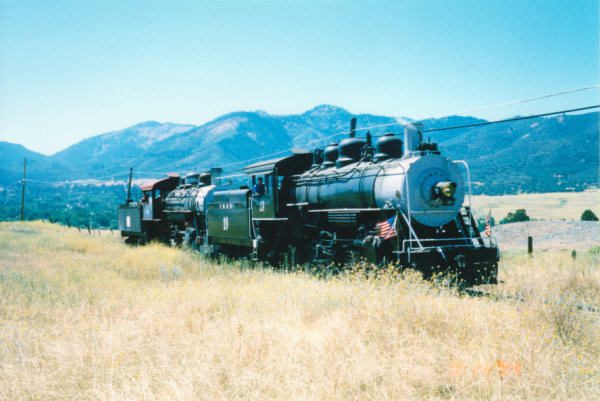 The exhibit was sponsored jointly by the McCloud River Railroad and Lumber Companies, the Red River Lumber Company, and the Weed Lumber Company. The primary piece of the display was a house built entirely out of the products of the three sawmills, including a fireplace built of volcanic rock from northeastern California. The McCloud River Railroad provided this display train consisting of the brand new #18, two carloads of the finest old growth logs the McCloud forests had to offer, a boxcarload of lumber produced from the McCloud mill, and caboose #015. Drawing from a 1923 appointment book produced by the lumber company. 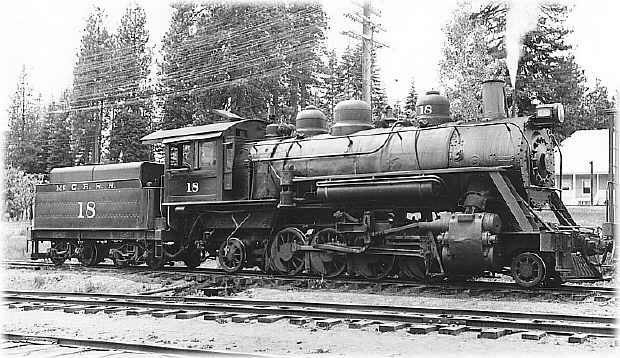 Locomotive #18 near the McCloud depot. Photo from the George Landrock collection. No date,photo credited to Guy Dunscomb. Wooden cab and headlight mounted on top of the smokebox dates this photo to sometime before the late 1930's. Photo taken by McCloud roundhouse. Once again no date, but steel cab and centered headlight date this photo to the late 1940's/early 1950's. Photo taken at McCloud depot.. 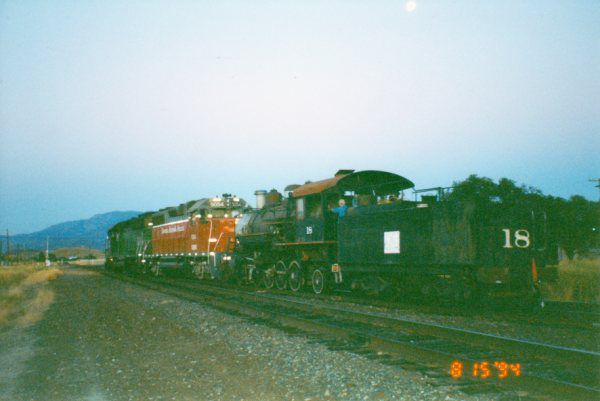 The #18 spent about thirty years sitting in Yreka, California, before being re-sold to the McCloud in 1998. Photo taken circa 1987. The #19 towing the #18 out to Montague following the #18's sale to the McCloud Railway. Courtesy Yreka Western archives. A Central Oregon & Pacific freight has picked the #18 up from the YW interchange in Montague and is starting the unit south for the Union Pacific in Black Butte, who will complete the delivery to the McCloud Railway at Mt. Shasta City. Courtesy Yreka Western archives. Builder's plate of the #18.